Jean-Paul who? Jean Paul Sartre. Thus spake the irrepressible Monty Python crew. And as far as I’m concerned, recommendation don’t come better than that. So when Lurpak buitter asked me a couple of weeks ago to bake something seasonal for them live on Facebook, is it any wonder that my thoughts turned to rhubarb tart? To me, there is something quintessentially English about rhubarb, as if it is the kind of fruit that Terry Pratchett might have made up had he been called upon to do so. The fact that it is grown in darkened sheds and harvested by candlelight seems not too far from the idea that the world whizzes through space resting on the backs of four elephants and a giant turtle. And the fact that it is a vegetable which they treat as a fruit, and not a particularly sweet one at that, speaks volumes about the English tradition of making do. Eating rhubarb is like having the English psyche in a bowl. These delicious little tarts make the most of the bright red colours of both the strawberries and the rhubarb, while allowing the berries to make up for the sweetness that the rhubarb lacks. I made my mini tarts in 8 x loose-bottomed 3.5 inch fluted flan tins, but you could also make the recipe with 2 x 6 inch loose-bottomed fluted flan tins if you like. I do not bake my crust blind, but you could if you wanted to; but then you probably have to cover the exposed crust with foil while the filling bakes, in order to prevent over-browning. The tarts are fabulous – a light, flaky crust and a jammy filling that never becomes cloyingly sweet, thanks to the tart rhubarb. Serve them as dessert, or at teatime – or as an indulgent breakfast treat! Wash and chop the strawberries and rhubarb. In a large bowl, combine the chopped fruit, Prosecco, sugar, corn starch, lemon juice and ginger. Stir well to mix. Leave to macerate while you prepare the pastry. Measure out the flour, icing sugar and butter. Beat the egg yolk lightly. In a clean mixing bowl, rub the cubes of butter into the flour, sugar and salt mix using your thumbs and forefingers. The mixture should end up resembling breadcrumbs. Stir in the lightly beaten egg yolk and iced water and mix until the dough comes together to form a ball. If mixture is too crumbly, add iced water 1 tsp at a time, mixing between each addition. Knead mixture lightly with your hands until it comes together. Use a lightly floured rolling pin to roll the dough out on a clean surface. Roll until the dough is about 3mm thick. Cut or tear pieces of the rolled dough about the same size as your flan tins. Using your fingertips, press the dough into the tin, making sure the base and sides of each tin are evenly covered. Melt a little butter and brush a thin layer over the base of each flan tin (this will help stop the tart crust from becoming soggy). Chill the tins in the fridge for 15 minutes. Pre-heat the oven to 180C. Fill each flan pastry case with fruit. Spoon 2 Tbsp of the macerating liquid into each mini flan tin (or 6 Tbsp into each large flan tin) but do not overfill – leave room for the liquid to bubble up during cooking. Place flan tins on a baking sheet and bake in the lower half of a pre-heated oven at 180C for 45 mins (for mini flan tins) or 60 mins (large flan tins), until crust is golden and liquid has set to a jam-like consistency (NB – it will thicken upon cooling too). Remove from oven and allow to cool before removing from tins. Use palette knife to remove from base of flan tin. Garnish with mint and serve with crème fraiche. rhubarb ginger and cranberry fool. 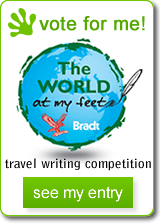 As some of you may know, I have entered my first travel writing competition! Please click on the icon below to read my entry and if you like it, I would really appreciate it if you would rater the story in order to vote for me in the People’s Choice section of the competition. Thanks!! I have been inindated with rhubarb lately, but I do love it. I even made a rhubarb tea, which I think takes second place next to your tarts. I was so fascinated with you and Facebook, but at the same time sad that I could not bake along…..thx for sharing so that I can catch up with you innovative lot! Wish we could get lovely looking rhubarb like that over here, alas the only ones I’ve seen have been rather sad looking. Which is a pity, because I do love the taste. There is just something about the sweet & sour mix of rhubarb used in a pudding that really makes me happy. Oooh they look amazing – What a fantastic combo! I am so on a strawberry, rhubarb, berry roll, Jeanne, and these look fabulous! Wonderful! I’m looking for the link for you for a very old episode of The Prairie Home Companion called “Rhubarb” which I know you will love! And as you may know, our bugged-eyed Boston Terrier is named Marty after Marty Feldman (the eyes, man) and our next one will be named Jean-Paul after, yes, Sartre. When I first came to UK from SA my mum-in-law introduced me to the rhubarb/strawberry combo in tarts and pies. In winter if she was making a rhubarb crumble with rhubarb she’d frozen she would add a generous spoonfull or two of strawberry jam – try it, it makes it divine! She also made umpteen jars of rhubarb and ginger jam, to which my husband and daughter are addicted. These sound delicious. I didn’t know rhubarb was grown in the dark and harvested with a flash light. My mother always had it growing in the garden. Ooh how yummy, perfectly pink Rhubarb from root to tip! The rhubarb I have grown in Jozi has only about 4cm of colour and the remaining green stem I don’t bake with because it turns an unappealing grey. I’ve been loving the rhubarb and strawberry combo (in ice cream mostly) this year and your tart looks delicious! plus any post that references both monty python and terry pratchett is a winner in my book! This is one pretty looking thing.I wish I could do this together! Those look so cute, I haven’t had strawberry and rhubarb together would you believe but I really love the sound of it. Nice looking tarts! Strawberry and rhubarb is such an amazing flavour combo! I think it’s time for me to give Rhubarb another chance in my kitchen. All I need now is for our local strawberries to be a little sweeter. 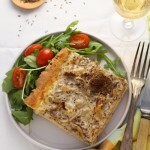 Thanks for your recipe and the visuals on your wonderful looking tarts. Rhubarb is really an amazing vegetable/fruit, Sicilians are not too familiar with it, but I have had it on a many occasions and appreciate it’s flavor. The thing I have a hard time dealing with is the darn strawberries that have no flavor. In the past few years it seems they only grow huge flavorless strawberries, and who knows where they come from. In any case Your recipe looks lovely. Oh Jeanne – how I love the comparison of the English and rhubarb!! We’ve been getting some wonderful stalks recently in Knysna, so am off to get some straight away!! Oh my, these tarts sound out of this world. Prosecco, rhubarb and strawberries are just the best combination. Commenting as BritMums Baking Round-up Editor.